Ever wondered what is causing those headaches and bouts of breathlessness? We tend to take medication without giving a thought about the air quality around you that might have contributed to your health issues. Pollution has now become a worldwide phenomenon and is causing a lot of problems both to the environment as well as to its inhabitants. To determine the level of pollution present in the atmosphere, several devices are used which are large, bulky and quite cumbersome to carry around. But NotAnotherOne, a US-based company that specializes in smart devices such as Wi-Fi Cameras, Smart bulb, and Smoke sensors have come up with Atmotube, a portable Air Pollution Monitor that would do the job of its bulky counterparts. Atmotube is unique in itself due to its portability, affordability and its convenience for personal use. It detects air pollution, a wide range of volatile organic compounds (VOCs) and harmful gases like Carbon Monoxide (CO), measures air temperature and humidity. With fast response time to environment changes, it can measure air pollution at home or on the go. With Titanium-coated body, the device has an elegant design and fits snugly in your palm. The RGB light in the device indicates the air quality present in the surroundings. The readings can be obtained real-time by using the apps that are available both in the Play Store and the App Store. Due to its portability and affordability, Atmotube has managed to stave off competition provided by devices such as Netatmo Weather Station, Withings Home, and CubeSensor which are on the expensive side. Founder of NotAnotherOne, Vera Kozyr tells that they faced several difficulties in the making of the device. They had to ensure that the sensor worked stably and accurately. Also, they found it very hard to find the right materials for the device, since most of the plastics, adhesives, resins, etc. emit VOCs that would affect the accuracy of the sensor’s readings. 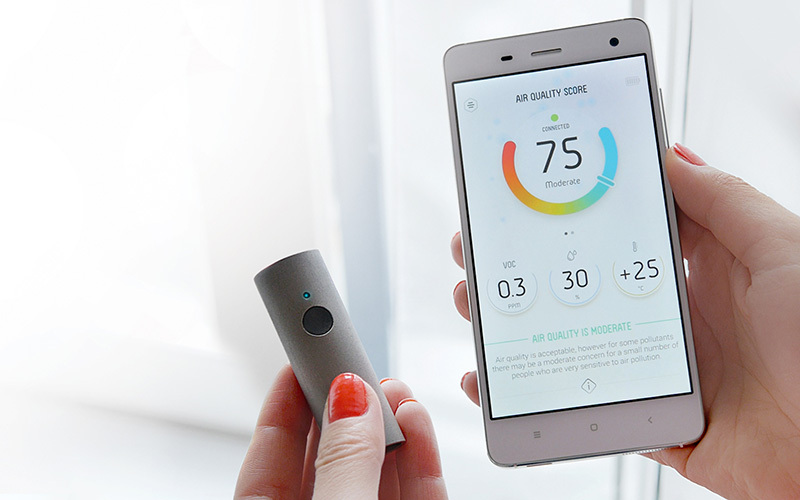 By branding it as a personal device, the company aims to reveal real-time air pollution globally, help identify real dangers and locate sources of the pollution, estimate health risks and warn people in advance about potential impacts of the polluted environment. They look to target people living in big cities with high pollution levels. The product is also vital for people who suffer from asthma and Chronic Obstructive Pulmonary Disease (COPD), aiding them in steering clear of environments that could aggravate their conditions.